Happy 2018! Hope you've had a wonderful new year. Many apologies for the disappearance for the later half of the year - my iPhone died, and I lost all my photos from the past two years. It was an extraordinarily painful experience, and I would not wish it upon anybody. Always remember to back up your phone, and buy more iCloud storage space if you have to. It's worth it! Anyway, I have a few new coffee diaries lined up and I can't wait to share them! To round off 2017, my family went on a holiday to Osaka and Kyoto! We last visited those cities 12 years ago, and all I remember of Osaka was the aquarium and Universal Studios Japan. I barely remember Kyoto as we took a day trip then, and it was raining, so we didn't get to see very much. Unfortunately, ten-year-old me lacked an adventurous appetite as well - I didn't even eat sashimi, and I'm sure my parents knew that good beef was wasted on young children - so I don't even remember what I ate too! This trip felt like I was visiting a place for the first time, yet there was a sense of familiarity, comfort and growth. Most noticeably, the palates of my sisters and I have developed considerably, and we ate so much - okonomiyaki, takoyaki, and soft serve ice cream, amongst other things. Japan is truly the land of good food and the best part is, you don't need a sky-high budget to enjoy the food. We also went on a few coffee adventures this trip! Although Osaka and Kyoto's cafe scene isn't as developed as Tokyo's, there are some really lovely spots in these cities, and I am so glad to be sharing them here! Osaka feels like a mix of Tokyo and Kyoto - you get the city vibes, but there is also a sense of culture and tradition. Mill Pour is located in Shinsaibaishi, the shopping district of Osaka. It's a tiny shop with just a few boxes for seats outside, and an espresso bar on the inside. It is quaint and cosy. It is primarily a takeaway joint, although you can sit outside and people-watch - it's a lovely experience, especially in winter with a warm cup of coffee in hand. I ordered a latte, which tasted of plums and grapes, with a lingering chocolate aftertaste. 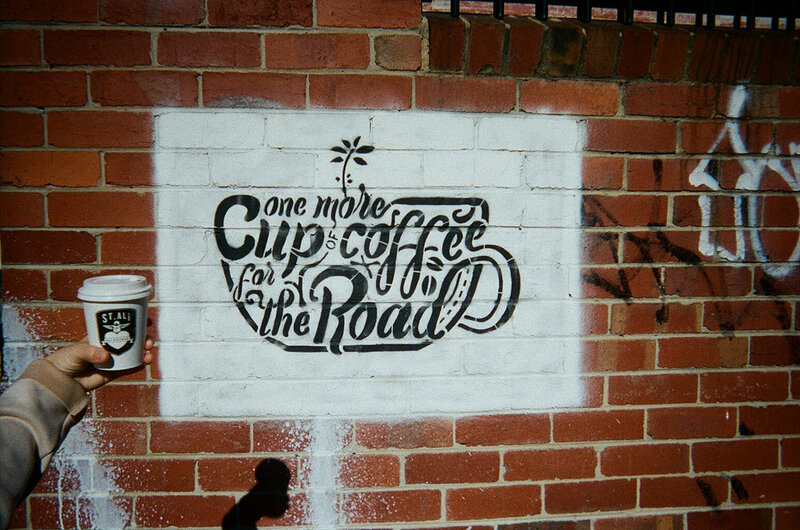 It reminded me of Commonfolk's coffee in Melbourne, one of my favourite coffees in the world. The texture was smooth, rounded and creamy. Mill Pour is an escape from its fast-paced environment, with a number of office workers scuttling about and tourists making their way from one shop to another. 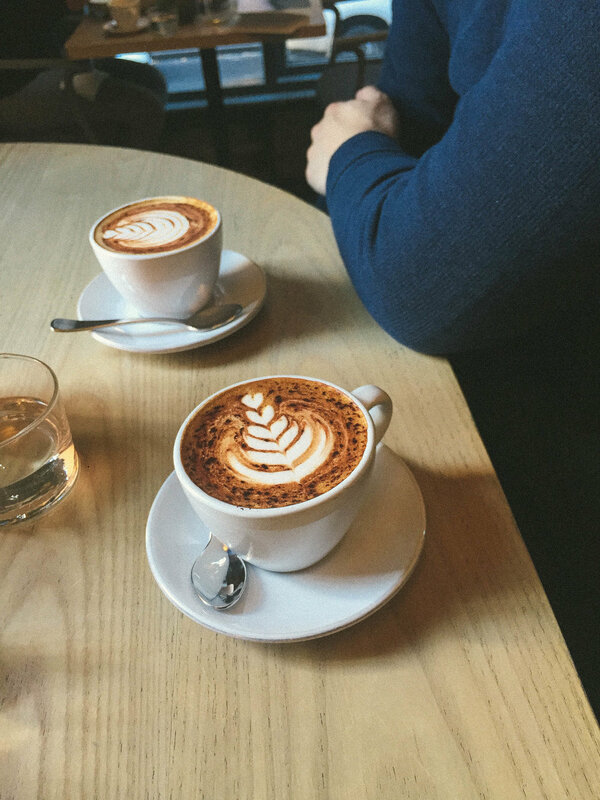 Come here for a pick-me-up between your shopping trips; or just for a breather. Lilo is another tiny cafe in Shinsaibaishi. It's closer to the hipster stuff, the tiny streets and the Osaka version of Harajuku (Amerika-Mura). Lilo Coffee Roasters is a comforting hideout from the cold winter, and the high tables and chairs remind me of the warmth of a bar. It's situated next to a hair salon, Lilo in Veve - apparently, the cafe is a spin-off from the hair salon, borne out of their love for coffee. I had a flat white. Each coffee comes with a card with the tasting notes of your coffee, and the way they've presented the information is so cool! There are days when I just feel like drinking my coffee without thinking much, and such a card is perfect for letting you know what you're tasting without you having to think hard and figure it out on your own. That said, I found the coffee to be a little more on the acidic side, and somewhat reminiscent of dark chocolate. I don't think my palate is very refined, though. My sister had a matcha latte, and just look at that latte art! It's adorable. My sister asked for the matcha latte with less milk, which resulted in a well-balanced drink - neither too bitter nor too sweet. This cafe is truly a gem. We were leaving the Osaka aquarium and in need of a good coffee. I was scrolling through my coffee list and google maps, trying to find a cafe to visit when my sister pointed 9 Borden Coffee out to me. It hadn't come up on any of my google searches for "good coffee in Osaka", but I was enticed by its warm, hipster-looking exterior, and decided to give it a shot. It turned out to be a good shot indeed - it's a lovely, homey cafe, and the coffee is excellent! I had a rather strong cappuccino which tasted faintly of citrus. Swirl the coffee around in your mouth for a bit, and you'll find that it is very sweet and creamy. A wonderful respite from the cold. I tried a sip of the creme brûlée latte from my sister, which tasted like Starbucks' toffee nut latte! A wintery, Christmassy drink indeed, perfect for the Christmas season! The cafe has many charging points and free wifi, and it would be a great place to get some work done. I loved the abundance of natural light, and the many plants inside the cafe. The cafe is owned by a Canadian-Japanese couple, which explains why there is a lovely picture of Toronto on the wall! My dad was so excited, because he used to study in Canada. On another note, I do hope I make it to Canada someday. I hear they have quite a coffee culture. Said picture of Toronto - the other half is in the picture of my sister above! I do hope some "best coffee in Osaka" lists start featuring this cafe! It deserves more exposure. If you make a trip to the Osaka aquarium (and I highly recommend that you do - they even have a whale shark in their aquarium! ), do stop by 9 Borden Coffee. There are two Brooklyn Coffee Roasters in Osaka - one in Namba, and one in Kitahama. We visited the outlet in Namba, which is located under a highway, which explains the industrial, gritty vibe going on, contrasted by the cafe's bright and colourful logo. There are a few vendors in the space: there is Brooklyn Coffee Roasters, a pizza joint, and a bar. I got an iced latte. Some days, you need to fight the cold with cold. I guess you could apply the same logic as to why you should drink hot drinks on a hot day - apparently, hot drinks make you sweat more, cooling you down as a result. So, drinking a cold drink makes you sweat less, thus retaining more heat in your body? I really enjoyed this iced latte! I found it to be a little acidic on its own, but once you mix it with the milk, it becomes incredibly smooth, and the coffee took on a very nutty, caramel-ly flavour. There was also a "lingering almond-y aftertaste" (what I wrote down while drinking it). Absolutely delicious, and I didn't want it to end. The balmy weather certainly helped - the temperature was cold, with a hint of warmth from the sun, so I moved outside to take pictures and drink my coffee for a bit. It was a beautiful morning indeed. On a side note, we got a slice of pizza to share from the pizza shop! It was a delicious slice of pepperoni - the base was thin, and the crust being especially crisp. This is important, as soggy crusts are disappointing, and no one deserves a soggy crust. Unless, of course, it is a cheese-stuffed crust. This was a surprise find, and a pleasant surprise it was. I didn't think the area that we stayed in had lots of good coffee, but this is a hidden gem. Cafes in department stores are usually a hit-and-miss - they're either decent or terrible. We were doing a bit of shopping on our last morning in Osaka, and didn't have time to venture out as a result. We stumbled upon this place when we were visiting Loft, and thought we'd give it a shot (pun intended). It's so pretty! I got a cappuccino. It was balanced and creamy, and so buttery! My sister said that her cappuccino reminded her of fried rice, in that it was like a meal. I'm going to take that as another way of saying that it was wholesome? Because it was. Definitely a great pick-me-up, I think they have various outlets located in malls around Osaka. After Osaka, we headed to Kyoto. Coffee diary coming soon. Stay tuned! This was the product of a happy accident! I've missed playing around with recipes and leaving room for experimentation. It's the second week of school, and I miss the summer holidays already. It's been a rather productive summer - a restful trip to Australia, two internships, and lots of sleep and shows in between. I've emerged with a clearer inkling of what I want in the future and a deeper sense and understanding of self. I have also discovered Billions, which is the best show I've watched in a long time. I made these cookies on a whim - the baking bug had hit, which was nice because I haven't been hit by the baking bug for a long time before this. I'm glad that I was baking more this summer. I feel particularly inspired and motivated. This summer, I understood and witnessed firsthand just how and why so many people in our profession leave in a matter of years. It doesn't quite have to be this way; but the environment really does make a big difference. Really thankful for the people I've met and the friends I've made this summer, and for Nat, who listens to me and supports me throughout. I'd initially wanted to make my favourite chocolate chip cookies, the tried and tested. But I'd made a huge batch of salted caramel last weekend (that's what happens when your heavy cream expires in a day) and I had over a jar of it, calling out to me to be baked into something! I planned to stuff these cookies with the salted caramel or flavour the dough with it, but the dough was just really wet. I ended up simply spooning teaspoons of salted caramel atop the cookie dough. What differentiates these cookies from the typical choc-chip ones is that I was lazy in making this batch, and didn't bother letting the brown butter cool down before going ahead with the remaining steps. As a result, the mini dark chocolate chips I used had melted into the batter when I stirred them in, essentially making the cookie dough a chocolate-flavoured cookie dough, and not chocolate chip cookie dough. The chocolate flavour isn't particularly strong, but it is there. It balances the natural sweetness of the dough and the caramel, given that dark chocolate was used! I suspect milk chocolate might sweeten it a little too much. These cookies are especially crackly; similar to those brownie cookies that you see on baking blogs here and there. I did a quick google search, which told me that cookies crackle when the outside of a cookie solidifies, but the inside is still baking. While the regular cookies aren't that crackly, I suspect this result is amplified by the caramel in the middle, which covers the middle of the cookie. This result can be amplified by chilling the cookie dough (a greater change in temperature = insides take longer to warm up = cracklier cookies!). Ah, baking science. TO MAKE THESE COOKIES: Follow this link - here - or just search for the CCC Quest: Episode 5 in my Recipes tab. Follow the steps, but don't cool the butter, and work as quickly as possible from start to finish so that the chocolate chips melt into the cookie dough. Add some caramel sauce on top - you can use a store-bought one, or you can make yours from scratch! I've been using the same salted caramel recipe for years, and it has never failed me. The recipe is from Sally's Baking Addiction - once of the first baking blogs I started reading! It's so simple, and has never failed me. All you need to do is heat 200g of granulated sugar in a saucepan until it melts completely. Cut 90g of butter into cubes, and once the sugar is melted, add the cubes in one by one. Keep stirring as you add the butter in. When you have added all your butter, drizzle 120ml (1/2 a cup) of heavy cream into the saucepan slowly. Be careful, as the cream will be cold and the caramel will start to bubble as you add it in! Continue stirring, until the cream has been mixed in - the sauce will be thin, and should be a lovely golden brown. Add a teaspoon of sea salt, and stir. Remove from heat and let it cool - the sauce will thicken as it cools! This post is also the Inconvenient Edition. 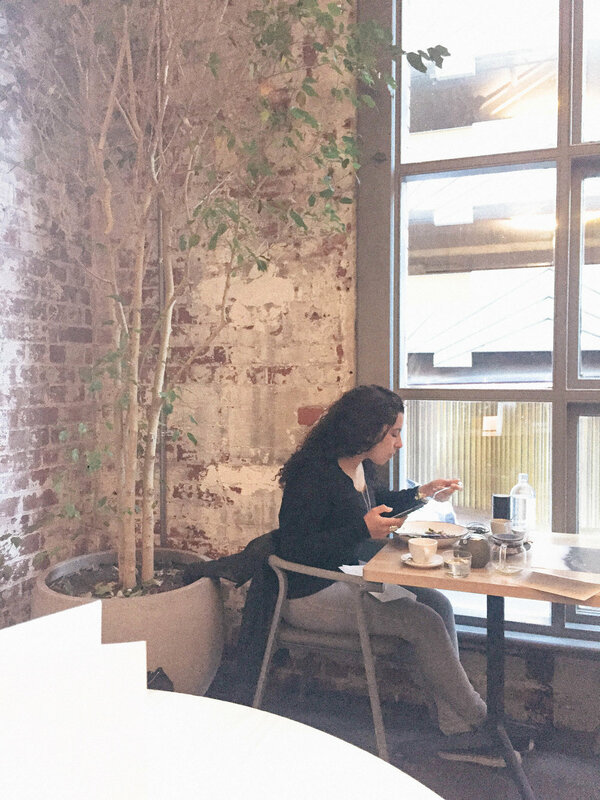 While most of the cafes listed in parts one and two of my Melbourne Coffee Diary are located within the CBD or close to it, this list comprises cafes that are further out of the way. By 'out of the way', I mean areas that (tourists) would not readily visit, are harder/take longer to get to, and don't really have anything much going on. Except for some great coffee places, that is. Industry Beans is located in Fitzroy, one of the hipster suburbs in Melbourne. The walls are filled with graffiti and there's a bit of an old-school vibe about the area, thanks to the charming architecture along the main street. Walking towards the cafe, you'll notice a more industrial vibe which Industry Beans themselves certainly give off. It's a cool, chill place, with a nice outdoors area where people brought their dogs along with them in their coffee run. We sat outdoors, and what a nice morning it was. Industry Beans' coffee turned out to be one of my favourites of the trip - its simplicity won me over, with its straightforward dark chocolatey and citrus notes. The kind of coffee you don't have to think very hard to appreciate. The flavours hit you straight on, bright and clean. It's a great coffee for both slow and fast mornings - so I brought home a bag of their coffee beans. Yes, it's that Tina Turner song. Another fun fact - Proud Mary's coffee machine is made up of two three-group Synesso machines that have been welded together to create a "custom six-group monster". Got that piece of information from Broadsheet, which is the resource you should go to when planning a trip to Australia, by the way. Anyway. The interior of Proud Mary is rustic and homely, with natural light streaming in from all directions. We were lucky enough to grab a window seat, where the afternoon sun hits the strongest (thus making for the best photos - see below). The coffee was thick and almost buttery. It was sweet and creamy, and Nat picked up a bit of a milo flavour in there. I could somewhat make it out when he alerted me to it, but it was a little faint. I found the caramel notes more prominent. Overall a good coffee though, and the idea of milo coffee? Someone should totally make it a thing. Axil wasn't quite on my list of places to visit in Melbourne, mainly because the cafe I used to work at occasionally brought in beans from them so I figured that since I've already (kind of) tried their coffee before, I should explore different coffees instead! Unfortunately, my intended destination - Hawthorn Common - was crazy busy the day we wanted to visit, so we made our way down the road to Axil, where we managed to find two seats at the communal table. I liked the texture of the foam on the cappuccino, which complemented the buttery texture of the coffee. A good and simple cup; easy to drink - much like how it is back in Singapore, where you can find it occasionally at One Man Coffee. So good news: you don't need to travel all the way to Australia for good coffee, when it is replicated right here on our little island. But for those in Melbourne, you don't need to travel out to Hawthorn for your Axil fix: they have an outlet in the CBD. This place was recommended to me for its avocado toast, so if you're heading there, you know what to get. That said, this was our very last coffee stop in Melbourne, and I am thankful that I got to visit it once before leaving. It looks like the kind of place that students visit when they want to get some work done, your typical corner shop cafe. I wish I got to stay, but no matter - I will be back for the toast (and even the coffee!) someday. The coffee is pleasant. For a place that doesn't hold themselves out to be a specialty coffee shop - I think of them as being a place for brunch - I thought the coffee was pretty decent. It has a faint berry and chocolate taste, with a tangy aftertaste. We sipped on this in between red lights on the way back to the airport, what a way to end the trip. This comes in last on the list because it's truly off the beaten track. It's nowhere near the CBD. We stopped by this cafe on our way to Sorrento beach, at the South of Melbourne. It is located in an industrial area, and the cafe itself is located in a warehouse; truly blending into its surroundings. From the outside, it just looks like another ordinary warehouse, sans the boxes and trucks on its driveway. But step inside, and you are greeted by the aroma of fresh coffee, a buzzing of the coffee machine, and an entirely different atmosphere altogether. When you're practically in the middle of nowhere (or so it seemed), you don't have to try too hard. The interior is quirky, and there's a lovely outdoor area that is exceptionally peaceful (probably due to its location). We got our usual cappuccinos and a Smartie cookie (!!) to-go. The coffee was something special; not like anything I have ever tasted before. It was definitely the most unique coffee of the trip. The progress street espresso blend is an interesting mix of blackberry, plum and chocolate. The flavours complemented each other, and while I don't eat plums in real life, I would definitely drink it in a coffee if done just like this. It felt somewhat like an East-meets-West kind of mix, when Asian flavours meet espresso. Most of their coffee is sourced from developing nations, and apparently twenty cents of every coffee sold go towards an initiative called The Cup That Counts, which seeks to create a sustainable and transparent coffee industry in Uganda. I love the heart that goes into this place, and I'm really glad we made the trip out. I'm going to cheat a little here... 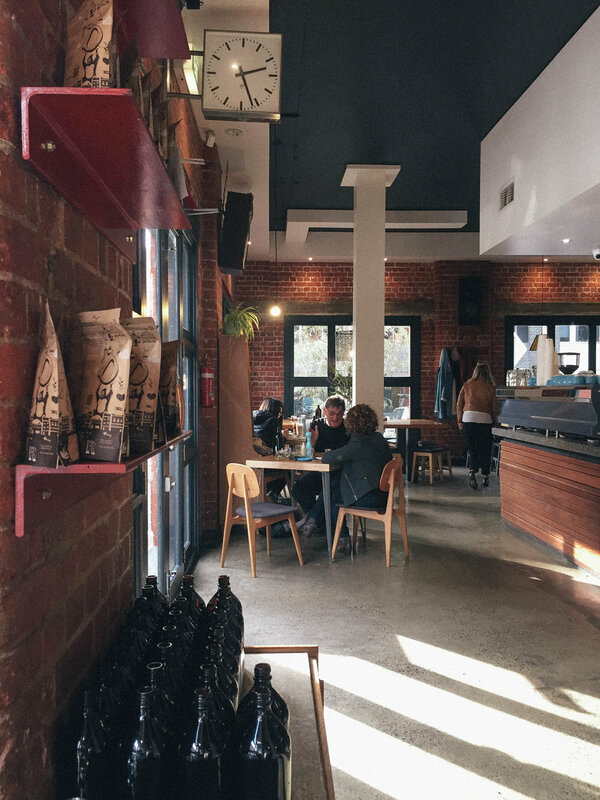 If you're living closer to the CBD or short on time during your trip, Industry Beans is your place. 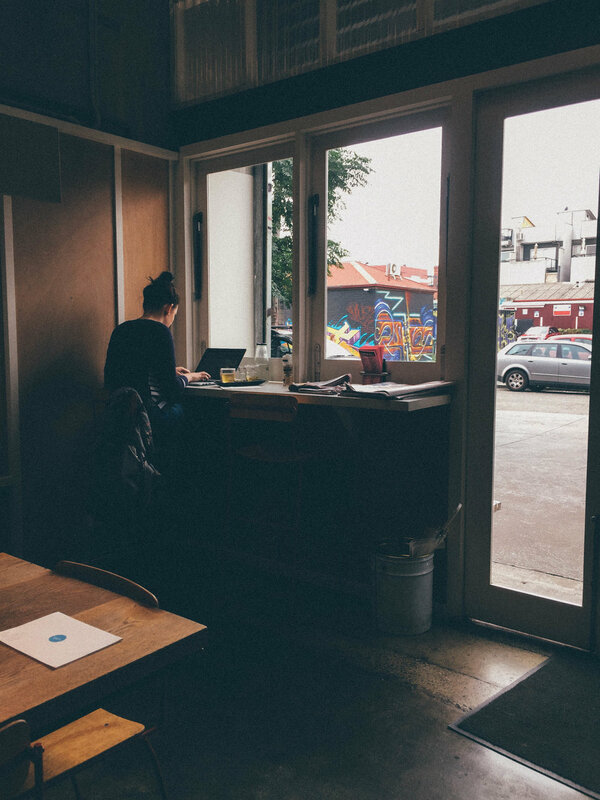 Great coffee, and a lovely atmosphere for you to chill and/or get some work done. But, if you have the time to travel a little further or if you're heading towards the Mornington Peninsula (i.e. to Cape Schanck, Sunny Ridge Strawberry Farm, etc.) - please visit Commonfolk Coffee Company. It's worth the trip, I promise. Now that my first internship is over, I'm glad to have time to write and edit pictures again. I always come out of internships feeling like I should make the most of my last few years as a student, and bake and travel as much as possible. I miss travelling very much - how I wish I could go back to Australia right now, or book a flight to Bali or something for a quick getaway! Since work ended, I've been trying to figure out what modules to take and how this whole bidding thing works. While I'm excited to be doing electives, I miss having my modules pre-allocated to me, your schedule simply handed to you. In fact, the law bidding system is already significantly easier than the bidding system used by the rest of nus. Honestly, I think I've gained a deeper appreciation for my faculty in the last week than I have in the last two years. I'm also very thankful to have someone to go through all this information and help me figure out what I want, although this isn't a problem for him (yet). Going back to the coffee diaries - part two has both hits and misses. It features my favourite coffee of the entire trip, but also two coffees that I believed to be more chocolate than coffee! I decided to put them together to balance this list out a bit. Higher Ground is the sister cafe of The Kettle Black and Top Paddock - I believe everyone knows the latter for its famous ricotta hotcake, which has been recreated in the kitchens of many Singaporean cafes. I would've loved to go to Top Paddock as it's one of those places you should go to at least once when you're in Melbourne, but it wasn't very convenient given our four-day itinerary in Melbourne city. Since all these cafes are by the same people (and all of them have the famous hotcake), we decided to head down to Higher Ground since it was their newest opening and was located in the CBD, right where we were staying. The cafe's aesthetics are on point: high ceilings, large windows, lots of natural light. It's got this modern-industrial vibe about it. I liked the music they played: loud, but not intrusive, and the kind of music that makes you feel good. I didn't expect much from the coffee, knowing that I came here primarily for the hotcake - but boy that latte art is gorgeous. First impressions do count for something, and I went in rather excitedly, only to come taste a mouthful of... chocolate. The coffee isn't strong and wasn't impressionable but the chocolate was really good. There were moments I forgot this was a cappuccino and thought this was a mocha instead. The Padre outlet we visited is located in the South Melbourne Market. It was a crowded Wednesday, and seats were hard to come by. We got our coffee in a to-go cup, but a table came up just in time! Hardware gets their coffee from Padre (see Coffee Diary (i)), but I personally felt that Hardware's coffee is better than their supplier's. Not that Padre's coffee was bad - it was a simple, standard cup: dark roast, caramel aftertaste, smooth textures. It should definitely be an option when you need a pick-me-up after making your rounds in the market, or when you feel like playing things safe. We stopped by St Ali's on our way to the Direct Factory Outlet at South Wharf (btw, not worth the trip - selection is not great and we pretty much left there empty-handed). It was a toss-up between St Ali's and Dead Man Espresso, both of which have 4.3 stars on google maps and look equally cool in their own ways. But St Ali's was just that little bit closer to us, so we headed there instead. Might have been one of the best decisions of the entire trip. I didn't know much of St Ali's before coming to Melbourne, not like how I knew some of the bigger names - Market Lane; Proud Mary, etc. It certainly isn't quite as well-known, and I can't think of any reasons why. To say that the coffee was a pleasant surprise would be an understatement, to say the least. I have never enjoyed a light roast as much as I have this! It had a clear mandarin flavour, coupled with hints of chocolate - reminiscent of a chocolate orange. It's sharp without being bitter, and at the same time it's not overly sweet in any way. This coffee spoke to my soul and refreshed me instantly. Definitely a must-try if you'll be in Melbourne! First things first: come here for the pastries, not the coffee. Sadly, I couldn't really taste the coffee itself. There was so much chocolate powder sprinkled atop the (already thin and weak) coffee, resulting in a coffee that felt more like a hot chocolate. It would make for a decent hot chocolate, though it was not what we were hoping for at 8 in the morning. But to be fair, this place isn't known for its coffee. Rustica is famous for its pastries, and I suppose that's why the cafe was so full at such an early hour. The passionfruit cronut that we got to-go was indeed something spectacular, and I really enjoyed it despite eating it a few hours later! Not quite satisfied, we made our way to Brother Baba Budan, which was only a few streets down from Rustica. It just so happened that a friend left a comment on one of my Instagram photos recommending their filter coffee to me, so we happily made our way over and ordered a filter coffee to-go. Little did we know that the cup of filter coffee was going to be very expensive. We strolled back to our apartment to pick up our luggage for our flight to Sydney, only to realise that our flight was leaving in 40 minutes and we weren't going to make it to the airport in time. So that's how we missed our flight to Sydney. We tried calling the Jetstar hotline, and they told us that we would have to book an entirely new flight (which would cost us $250 each!). 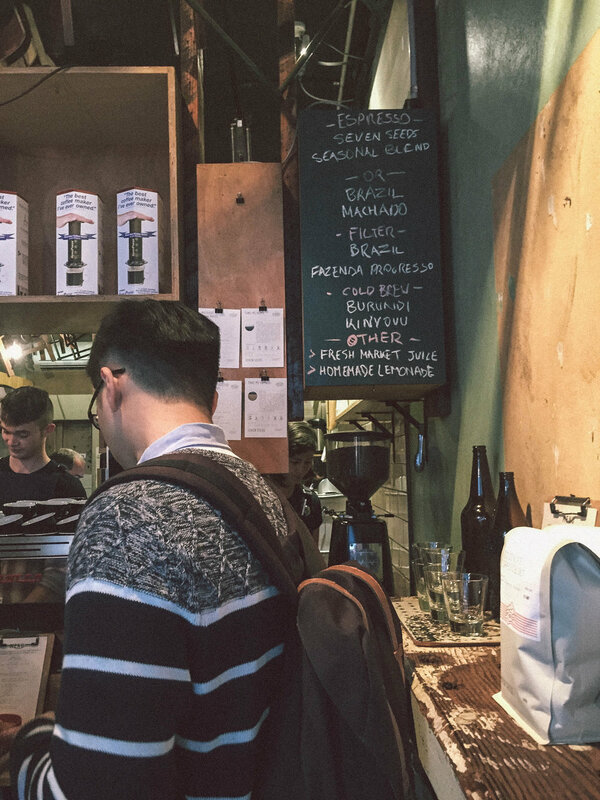 You probably saw this coming: St Ali's Coffee Roasters! I can't speak much for the cafe's atmosphere because we got this cup to-go, but the ten minutes I spent there was pleasant enough. It was busy (and with coffee so good, I can definitely see why) and there was a hip industrial vibe about the place. But the star is definitely the coffee. So, so good. Melbourne feels familiar, like an old friend - a city of coffee, welcoming me back with open arms. Just that I had never been to Melbourne until my most recent trip there. Maybe it is having read so much about Melbourne and its (glorious) cafe culture that makes me feel like I'd already been there. Or it may simply be that home (to me) is simply where the good coffee is. I used a cappuccino as a basis of comparison - I find that it strikes the best balance between the quality of espresso and milk. Australia may be the home of the flat white, but the few I did try were so milky that I couldn't truly appreciate the coffee. I had the impression that the coffee in Melbourne was going to be on the acidic side, similar to how the Scandinavians appreciate their coffee. I'm not much of a fan of the lighter roasts as I struggle to get past the bitterness to appreciate the flavours in the coffee. But Melbourne surprised me - even the lighter roasts were tastefully done, and very enjoyable. It might have to do with the fact that the coffee culture in Melbourne was fuelled by the arrival of Italian immigrants in the 19th century - bringing their mighty espresso with them. I'm going to break my coffee diary into a few parts, to keep things exciting and *~digestable~*. Also because I would like to keep my blog updated and I'm currently working, so it would probably be September by the time I get everything up in one post. On another note, I'm rather excited about the fact that Taylor Swift is back on Spotify. Guilty pleasures, just like my hazelnut cappuccinos. This was our first coffee stop in Melbourne, a two-minute walk from our apartment. It was 2pm on a Monday afternoon yet there was a long queue for a table. That said, we were lucky enough to get a lovely table outside away from the noise, and the weather was perfect. I ordered a flat white, and Nat, a cappuccino. The coffee had a chocolatey, balanced flavour - it was neither too sweet nor bitter, and the sharpness of the coffee comes out in the aftertaste. I found the milk overpowered the taste of the coffee a little in the flat white; but I guess that's how flat whites run the risk of turning out sometimes. Nat thought this was the epitome of a flat white, though! I enjoyed the cappuccino a little better, as the flavours were more pronounced. This was Nat's favourite cafe (and coffee) in the trip. Patricia is a hidden coffee joint with standing room only, which was the first thing that stood out to me when we finally located the elusive cafe. The focus is on their coffee, with a small selection of pastries to go with your coffee. As you can see below, there is a small menu with only black, white, and filter options. I imagine it is a convenient takeaway joint for the lawyers in the area, given that the Supreme Court of Victoria is just down the road! We settled into a little nook by a window, and someone served us sparkling water - such a lovely touch! It was very cosy and although the space was so tiny and relatively busy, we had more than enough space to really enjoy the coffee. The coffee had a thick and creamy texture (thanks to the milk), and I enjoyed the dark chocolate notes. It's simple yet complex at the same time - easy on the palate, but there is something more going on underneath. The coffee cup is probably what Market Lane is famous for - other than the coffee itself, of course. Everyone with an Instagram account knows Market Lane, but to be fair, I first found out about Market Lane through Instagram. The wonders of the world of social media! I visited the branch in Queen Victoria Market, where it stands out amidst the more traditional-styled eateries. My friend told me that this was one of the stronger coffees she had in Melbourne, and she was quite right - their coffee felt bolder and a lot more organic. I really enjoyed the fruity aftertaste - swish the coffee around in your mouth for a bit, and you get this lingering peachy aftertaste which is very delightful! Located down the road from the University of Melbourne, this is a convenient coffee joint for all the university students. I do envy them; living in a city where good coffee is so readily available! Seven Seeds has an interesting atmosphere about it - on first glance, it looks and seems like the kind of place you could kick back with a good book and a warm cup of coffee, but there is an undercurrent of busyness about it. The air is laidback, yet buzzing. Is this what living in a university town feels like? Our coffee was made with the Golden Gate espresso blend - sharper and brighter, with a lovely caramel flavour to it. It had a hint of tartness and fruitiness to it, which is probably attributable to the stonefruit (as mentioned in the tasting notes). I don't know what stonefruit is, much less how it tastes, but I could taste the caramel and chocolate, so that is the logical conclusion. We drank this on the way to the Melbourne zoo and it certainly was refreshing! Definitely Patricia Coffee Brewers. Drinking coffee is an experience, and Patricia was a lovely experience with its unique standing-room-only culture, sparkling water and delicious coffee to top it off. A great place for both the busy CBD people and tourists alike. I've decided to introduce this section as I'm splitting up my coffee diary into parts, and it would help if you only have time to go to a few places! It also helps to sift out my absolute favourite places in Melbourne as reference for future trips (on a platform other than in my head). It's always nice to rediscover places with someone you love. 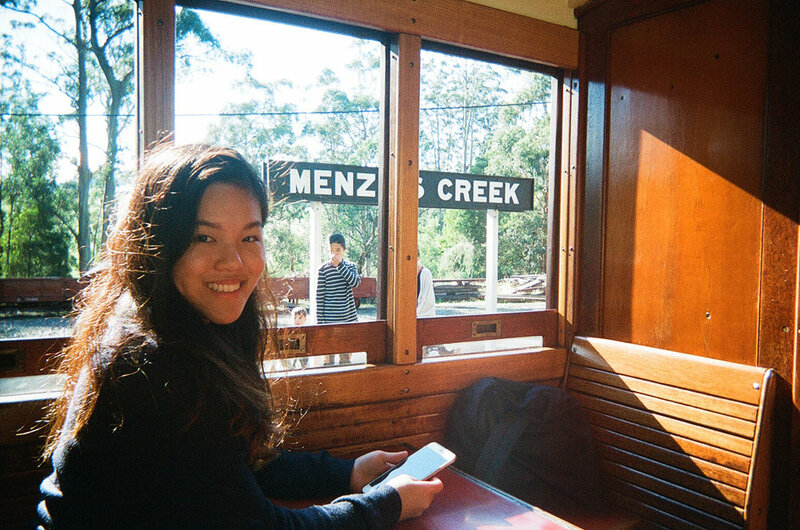 Nat and I are both familiar with Sydney and the Blue Mountains, yet our individual experiences were so different. For starters, Annandale was somewhere we hadn't heard of before, but staying in an airbnb near there introduced us to an entirely different neighbourhood far from the city. It is a quiet area that turns pitch dark at night - it's a very sleepy place. Our first proper day in Sydney saw us going on an adventure to some of my favourite places in the city. We started off in Newtown, where we visited Elizabeth's Bookshop. I last visited there during my trip in 2015, where I discovered the Blind Date with A Book section. Nat and I took turns picking out books for each other, and he loved the experience! I was happy to see that the random notes around the shop containing recommendations were still around, and that the bookshop hasn't lost its charm. 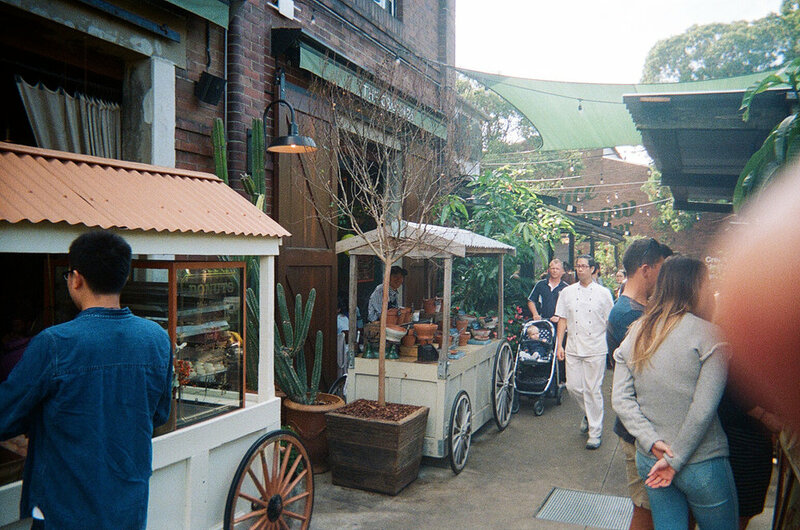 We made our way to the Grounds of Alexandria after, which is my favourite cafe in Sydney! The Grounds has this magical vibe around it - although it is situated in the midst of an industrial area, the cafe makes you feel like you're in an entirely different world. Everything was pretty much the same as I remembered, including the farm animals! On our second day, we did the Bondi to Coogee walk. Nat walked this trail when he was last here with his family, while I didn't get to on my last trip as I got to the beach just when the sun was going to set, so I was really looking forward to this walk! Unfortunately we picked a rainy day to go to the beach - the sky was pretty gloomy and it was pretty wet, but it was a beautiful coastal walk nonetheless. The wind was crazy, and that really added to the experience! The Blue Mountains felt like a change of season - it was significantly colder there but more importantly, the leaves were so colourful and the autumn vibes were strong! 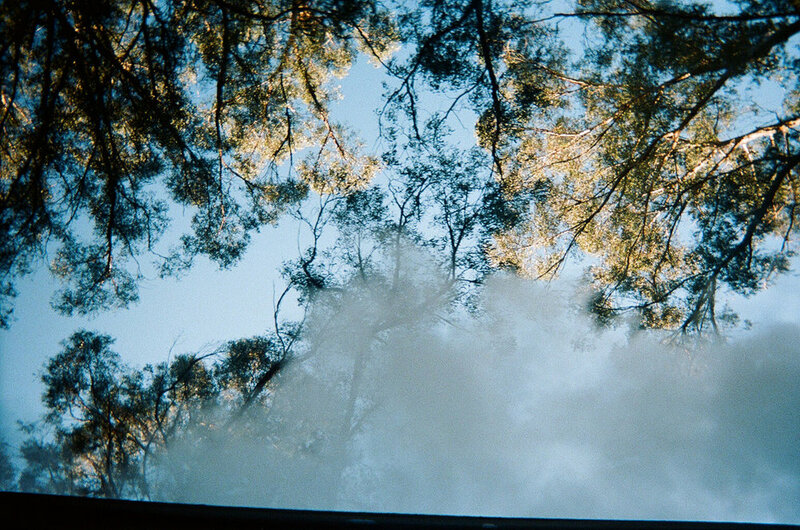 We stayed at Wentworth Falls, and it is so peaceful and beautiful up there - I'd love to retire there one day, hehe. We bought tickets to Scenic World, where Nat went on his last trip here! We took a walk into one of the forests, and the air was delightfully crisp and fresh. And we hiked through the mountains to find a waterfall. Recently, I downloaded a trial of Adobe Lightroom - the VSCO* of Mac Computers. You see, while I was in Australia, I simply didn't have the time or energy to import about a hundred photos into my VSCO account to edit every night. I was simply having too much fun, or was too tired out from the fun I'd had in the day. Either way, that is how a holiday should be - pure fun, not staring at an iphone screen. So I downloaded the trial to edit my many photos back in Singapore on a screen much bigger than my iphone's, hoping to (somewhat) save my eyes in the process. But while Lightroom is amazing and has gorgeous filters that really do replicate old-school film photos, Nat and I brought two trusty disposable kodaks along to Melbourne with us. There is something organic about an old-school film camera that cannot be replaced, and the anticipation! Of not knowing how those photos turned out gave us something to look forward to in the week we came back. While technological advances are to be welcomed, it's nice to take a step back sometimes. Melbourne (1), which we spent in the city exploring cafes and visiting the markets/SEA Aquarium/the zoo. Sydney, where we visited cafes and I brought Nat to some of my favourite spots from my last trip there and did a beach walk. Blue Mountains, where we visited scenic world and went on a few walks. Melbourne (2), during which we drove around the outskirts of Melbourne and Nat brought me to some of the places he grew up with. 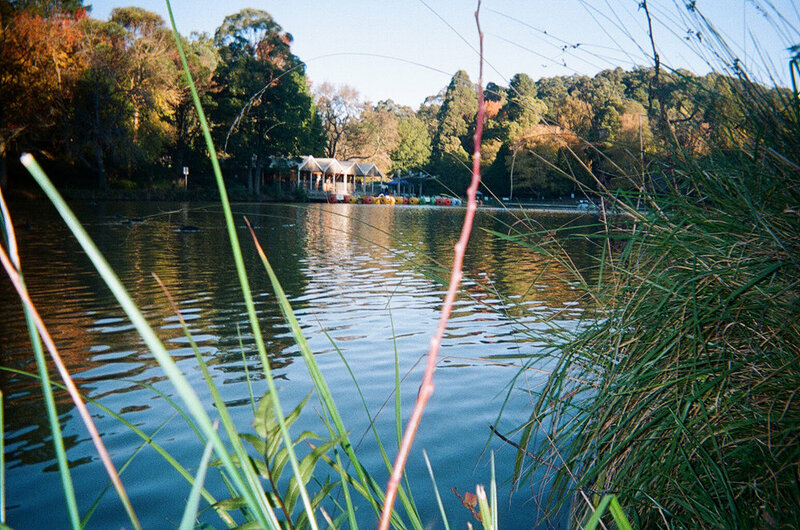 The photos in this post were taken from Melbourne (1) and (2), so there's a nice mix of city and countryside, which you'll see in the Sydney film edition too. The first two cafes we visited! They will be featured in my Melbourne Coffee Diary (coming soon). In the left photo is my notebook which I used to record my thoughts on all the coffees we tried, and on the right is the lobster benedict we shared. Flagstaff Gardens - Melbourne's oldest garden! The doughnut truck which revolutionised doughnuts for me - I never knew that doughnuts could be so soft and pillowy. Us drinking Padre Coffee at the South Melbourne Market (and me taking notes). I do regret not trying Simply Spanish's paella, but you know what they say - always leave something for you to try on your next trip. Melbourne has a lot of graffiti around - it's a refreshing change from the squeaky-clean walls here. It gives the city a lot of life, colour and vibrance - even though the shops close at 6pm. A great find outside the DFO - a row of trees with beautifully coloured leaves. 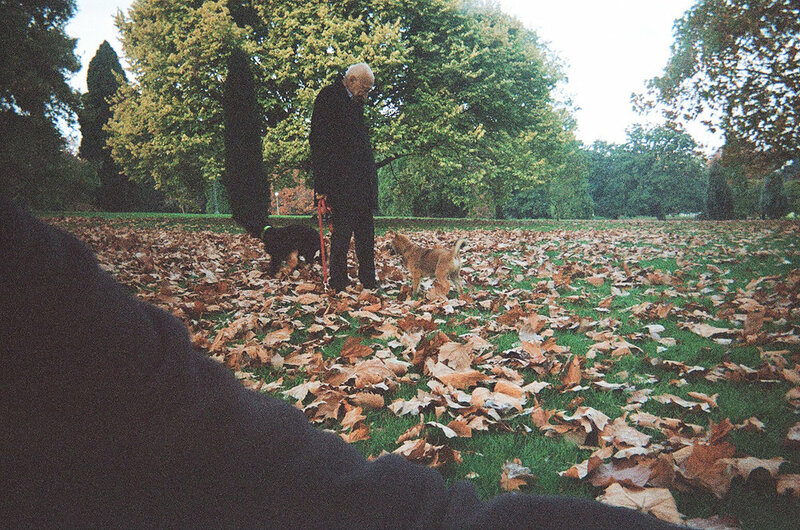 Now, that's Autumn. Shades of blue - the sky was very blue on this day! These pictures were taken during our walk from the South Melbourne Market to the DFO at South Wharf. But the Melbourne sky seemed to alternate between blue and grey between days. We were at the Royal Botanic Gardens, and the trees there were beautiful. If only law school was situated inside these gardens! On the left I am sitting on the grass, eating my almond croissant from lune croissanterie. You can't see it in the left photo, but my jeans are clean. On the right are the two dogs that got a little too excited seeing each other, and started running all over the Gardens... including all over me. My jeans were so dirty after, and I was suddenly thankful for my mom's foresight when she bought a few packets of dettol wipes for us at the airport. Nevertheless it was quite the experience, and the dogs were adorable. You never see dogs running around like that in Singapore, which is quite sad. My dog would never run around like that (she's too lazy). Proud Mary's pine mushroom toast with poached eggs and a divine parmesan pudding. While the first part of Melbourne was about the food and sights in the city, the second part focused on exploring the countryside and enjoying the peace and stillness it offered. Sorrento Beach! This was the 'back beach', not the main beach. It was quiet, and relatively empty - just us and a few other people picnicking. A very special day - we went to visit his old school back in Melbourne! It is a very homely place, and reminded me of my old school in many ways. At Yarra Valley! These photos turned out surprisingly well - we drove up on a relatively gloomy day and I was expecting the photos to turn out very dark, but I was pleasantly surprised. Especially the close up picture of the vines - film cameras, you amaze me. Us, and the unicorn at Helen & Joey's Estate. The dessert wines here are spectacular! At the Dandenong Farmers' Market. Predominantly a wet market, where many families were seen doing their groceries for the week. 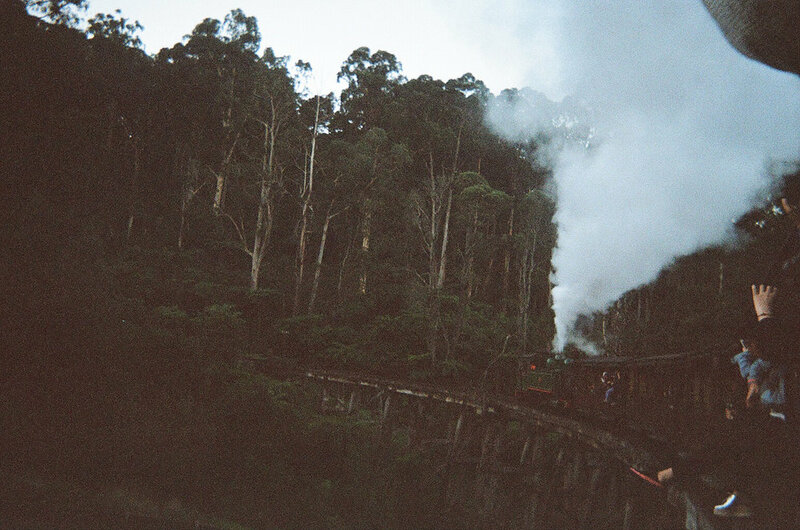 We also took the puffing billy! It's an old steam train that miners used to go up Mount Dandenong. We sat it to Emerald station, and walked to Lakeside from there, where the Emerald Lake Park is situated. Nat sat on the puffing billy a few times as a kid so it was nice to relive one of his favourite childhood memories together with him! We got to sit in the front cabin (which is mostly used for 'first class' passengers) as we reached late, so we were really close to where the coal is burnt and where the steam comes out - pretty cool. Some shots of the lake at Emerald Lake Park - the park itself is not very big, but it is surrounded by lush trees and populated by many ducks! A series of shots from our trip returning from the park. We managed to get some good angles of the train (with the steam coming out, no less!) but unfortunately I didn't use the flash so they are a little underexposed. The sun was setting, and the third and fourth pictures are glimpses of the vast spaces that can be seen on the train's journey, from openings between the many trees up the mountain. It was an exhilarating experience. The last photo is of us and the train conductor - a very friendly man! Also, the puffing billy is largely run by volunteers, most of whom operate the train or work in quirky jobs like porters, or signalmen. It's really quite the experience, and was a great way to end the trip. So this is just a brief overview of what went on in Melbourne, as captured by our film cameras. Of course, there are many more moments stored on our digital cameras (read: our iphones) and I can't wait to share them all here in due time.